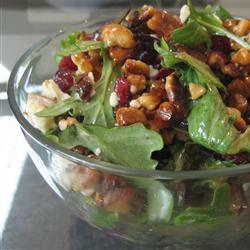 Place in a large salad bowl the mixed greens, cranberries, cheese, vinaigrette, vinegar, and olive oil. Toss gently; add candied walnuts, and toss again. –Allrecipes favorite.